Golfers make their way around the course during last year’s tournament. Hole sponsorships and signature sponsorships for 2018 are available! 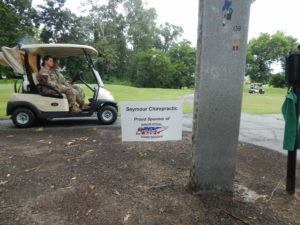 Each sponsor is advertised throughout the golf course. 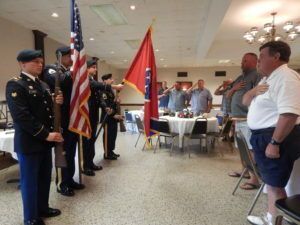 The Tennessee Veterans Business Association announces today a special promotion for the upcoming Second Annual TVBA Golf Tournament. Team play pricing has been lowered to $450 – that means each player costs $112.50 while one individual player admission costs $125. The tournament is limited to 21 teams, so sign up your team today! “At TVBA, we like to organize events that are beneficial to veterans. 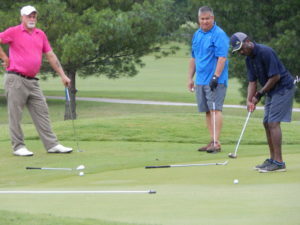 This annual golf tournament is not only beneficial – helping veterans network with one another in the community – but also is a great time for camaraderie and good times,” Program Ambassador Steve Stilts said. The Second Annual TVBA Golf Tournament will be held Monday, June 25th at Green Meadow Country Club in Alcoa. The day’s festivities will begin at 12 p.m. noon with lunch and a few words from a special guest speaker, who will be announced at a later date. The tournament will begin with a 1 p.m. shot gun start, and a clubhouse reception will conclude the tournament. Last year’s attendees heard inspiring words from retired Maj. Gen. Gary Harrell, a resident of Johnson City and decorated veteran who led dozens of overseas military campaigns. This year’s festivities will begin at 12 p.m. noon with lunch and a few words from a special guest speaker, who will be announced at a later date. Hole sponsorships are available for $200 and provide a fun advertising opportunity to reach a diverse audience. Companies also have an opportunity to sign up for a signature sponsorship, which includes booth space, marketing opportunities during the course of the golf tournament and free advertising on the TVBA website, social media and much more. All proceeds from the golf tournament will help to continue TVBA’s veteran resources, business events, networking opportunities and operations for such events as the golf tournament and the annual TVBA Keynote Dinner, Business Expo and Veteran Job Fair. Last year’s inaugural tournament was a blast and a huge success! 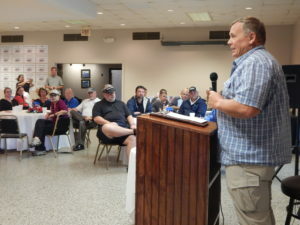 Over 50 golfers competed for trophies and heard inspiring words from keynote speaker retired Maj. Gen. Gary Harrell, a resident of Johnson City and decorated veteran who led dozens of overseas military campaigns. We look forward to seeing everyone again in June! To sign up as a sponsor, player or a team, please visit our website or contact Golf Tournament Organizer Steve Stilts at 865-414-2000 or sstilts@gotvba.com. Sign up today for the Second Annual TVBA Golf Tournament, which will be held Monday, June 25th at Green Meadow Country Club in Alcoa. Team play pricing has been lowered to $450 for the 2018 TVBA Golf Tournament!